One of the biggest perks about working on Embassy Row in Washington D.C. was going to lunch at the Italian Embassy. Some of the embassies have unique features that usually represent something in their culture. For instance the Japanese Embassy supposedly has a traditional tea house inside of its compound while the Finnish Embassy is known to have a sauna. In the case of the Italian Embassy — it’s an authentic Italian cafe. The eatery is casual yet polished with red walls and large black and white photographs of Italian celebrities drinking espresso, hanging on the walls. In the warmer seasons, an outdoor patio is set up with umbrellas and tables for people to eat outside. Italians hang out at the bar to get a macchiato before heading back to work upstairs. Then of course there is the food. The pizza and the pasta is just as good as any I’ve ever had in Italy. All the ingredients are fresh and everything is baked fresh that day. Needless to say — it’s no surprise that the Italian Embassy cafe attracts the staff of other embassy workers come lunch time. A Bespoke Event: Savile Row in D.C. 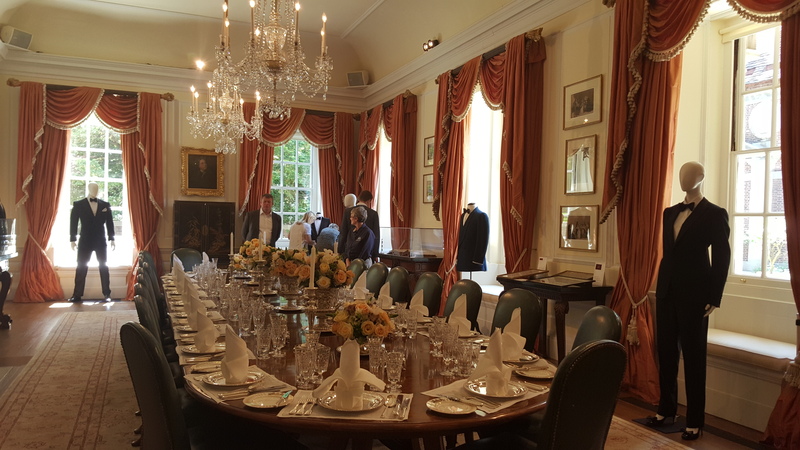 Earlier this week, an exclusive exhibition — Savile Row and America: a Sartorial Special Relationship — took place at the British Ambassador’s Residence in Washington D.C. The event paid homage to the craftsmanship and history of the tailors on Savile Row in London. The exhibits included everything from Buffalo Bill’s overcoat to Michael Jackson’s jackets. There were also special installations dedicated to Gregory Peck and Winston Churchill. Due to my current job, I was lucky enough to be be one of the many people to help put this exhibition together. This is just a snapshot of my favorite parts of the show. 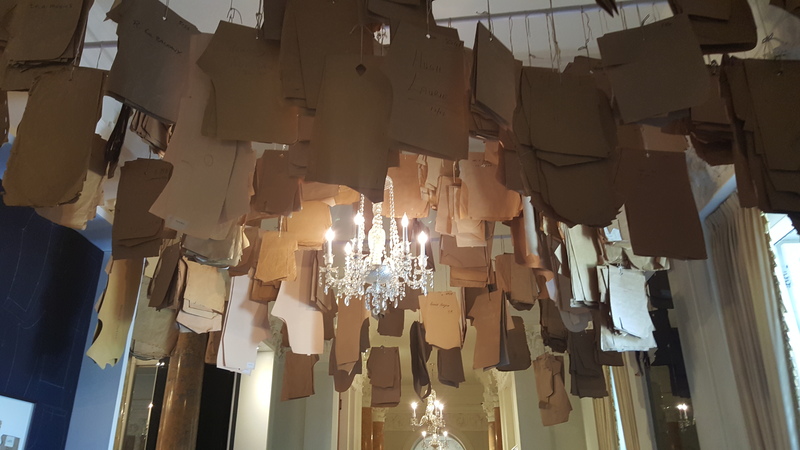 Just outside the ballroom of the Residence, cardboard patterns were hung around the chandelier. Patterns are cardboard cut outs of client measurements. Once a person’s measurement have been taken, a tailor saves the pattern so they can create garments for the client in the future without having to re-take their measurements. Some of the hanging patterns included those from Samuel L. Jackson, Hugh Laurie and Katharine Hepburn. Lent to the exhibition by Churchill’s family and private collectors — the display features Churchill’s military uniform from his time as a 2nd Lieutenant in the 4th Queen’s Own Hussars (a calvary regimen), a pinstripe suit and overcoat. Several heirlooms were also among the items. An engraved pillbox given by Churchill to his wife in 1908 is seen above as is an intricate cigarette box given to Churchill by his wife and later passed down to Churchill’s son, Randolph. These two keepsakes are particularly special as this is the first time they have been put on display. The dining room of the Residence was focused on formal wear. Some of my favorite pieces in this room included a blazer lent by David Oyelwo, who is famed for playing Martin Luther King Jr. in Selma. The blazer was worn at the Critics Choice Awards where Oyelwo was nominated for Best Actor. In the spirit of King, the lining of the blazer includes the lyrics to one of King’s favorite gospel songs. Another stand out piece is an Alexander Mcqueen jacket, which features a line of cigar smoke trailing across it. To add to the effect, a cigar was placed on the table next to the jacket to have the illusion of being lit. Alexander McQueen original. A “smoking” jacket. The ballroom was a collection of suits and garments that had links to Hollywood and celebrities in one sense or another. Mark Ronson’s cream wedding suit stood out at the center of the ballroom. Next to it was the blue and black dinner jacket Eddie Redmayne wore when he accepted his Oscar for “The Theory of Everything.” Not far from the original Andy Warhol portrait of the Queen, stood two of Michael Jackson’s iconic military style jackets from his world tour. Last but not least, a special tribute was paid to Gregory Peck and his valued relationship with Savile Row tailors, Huntsman. Gregory Peck loved his bespoke tweeds and wool suits from the tailoring house and according to his son, Anthony, often reserved the highest compliments for the Huntsman tailors/cutters for their craftsmanship and detail. Gregory Peck’s Academy Award for his portrayal of Atticus Finch in “To Kill a Mockingbird” was also on display. A film in which he wears a Huntsman blazer. The Savile Row and America exhibit was only on display for two days at the Residence. But, the event left an impression. Savile Row tailors have been creating garments and suits for well over a hundred years. The saying goes “There is nothing like a well- cut suit.” Suits made 40-years-ago can still be worn today. There is an iconic timelessness to a good suit, especially when it’s one cut and made specifically for you. Here’s to another hundred years for Savile Row. Two weeks ago on an extremely cold but sunny Sunday afternoon. A friend and I were slugging our way back to the metro station after seeing the last vestiges of Eastern Market in D.C. As we were turning to leave the market — I spotted a local bookstore my friend had mentioned wanting to check out. Upon entering, a grumpy looking old man in a worn baseball cap yelled at us to shut the door behind us. Then in the same breath informed us that there was home brewed beer in the back yard. This, Ladies and Gents, was our first introduction to Capitol Hill Books. Amused and a little disconcerted — we took in our surroundings. The bookstore was literally in a row house and it looks as though a hoarder of used books has filled it with every volume imaginable. Complete with three floors (basement, ground floor and upstairs) — the place was entirely cluttered and disorganized with large hulking book shelves filling every nook and cranny of the building. If there wasn’t space for a shelf to fit then there would be a pile of books stacked high. No part of the shop was safe from the onslaught of books. Even the bathroom had a whole genre of books in it — French poetry or theatre, I believe. As we made our way to the back of the shop — there was sure enough a door leading to a back yard. As promised, there were two kegs of home brewed beer with several people already filling up their plastic solo cups. A coffee porter and cherry ale. By the time we left (45-minutes later) the shop had begun to get crowded. We made our way to check out with four used books between us (including the earlier mentioned copy of The Little Prince) and having consumed four cups of the coffee porter (which was delicious). Capitol Hill Books as I came to find out, is a known D.C. gem and it’s no wonder why. In spite of how easy it is to order books online these days or go to a Barnes & Noble — there is something special about a quirky book shop. Capitol hill Books offers tons of personality. It’s not a place to go searching for a specific book but rather a place to discover a new one. 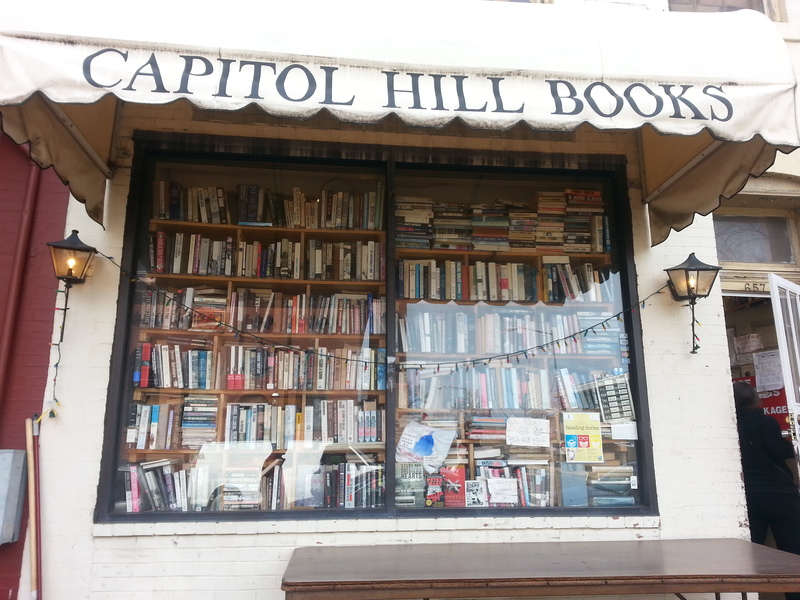 If you’re in D.C. and love bookstores — check out Capitol Hill Books. But, claustrophobics beware — it’s a tight squeeze! Nomad – a person who does not stay long in the same place; a wanderer. At the age of ten — after my first re-location from Japan to the U.S. — I had this unnerving feeling to “move”. At the time, I attributed this to my extreme homesickness for my birth place. Perhaps that was a big part of it. But, as I grew older I realized it wasn’t so much a need to go back to Japan but to just go….anywhere. Itchy feet, the travel bug, wanderlust…there are many names for it. Either way, I knew early on that settling down in one place was not for me. Today, at 27 I can happily say that I have succeeded (so far) in being a bit of a nomad. In the last ten years I have managed to live in six cities on either side of the ocean. Now, I am thrilled to say I have moved yet again. 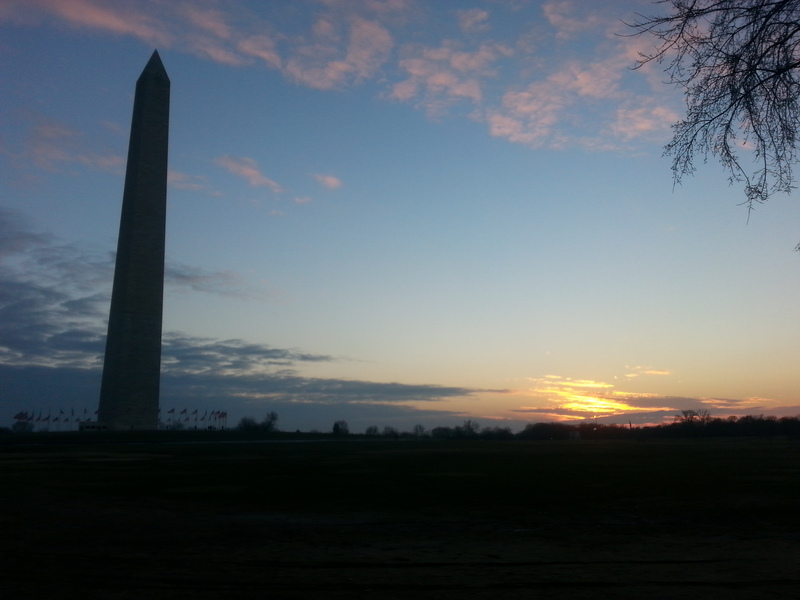 Washington D.C. will be my current place of residence — at least for a little while. I still have some posts on the back burner that I have been meaning to write about my beloved Pacific Northwest and I will finish those up in due time. At the moment, I am busy dealing with the stresses of starting a new job in the next couple of days, finding a place of residence and getting accustomed to my new surroundings. This is my first time living on the east coast and so far I love the fast pace of D.C., the diversity and of course the history! As I begin this new chapter of my life, I reflect on a few things I have learned. As we get older, it’s very easy to lose sight of what we actually want in life. We often settle for the jobs that pay well enough but don’t inspire or challenge us. We get too focused on making decisions that are safe as opposed to choices that will make us happy. Life is too short to just be comfortable. When it comes to getting what you want — sometimes you have to take a leap. A City of Monuments — Washington D.C.
Washington D.C. is a place filled with history and culture. There are so many museums and monuments that it’s impossible to see even half of it on a four day trip. So far my favorite places to visit are the International Spy Museum and the Library of Congress. However, I have a whole bucket list of things I still need to do in D.C. — including visit the Newseum!